Right-wing politician Iván Duque has been sworn in as Colombia’s new president. Duque has vowed to roll back key parts of Colombia’s landmark peace deal with FARC rebels. Just before his inauguration, Democracy Now! 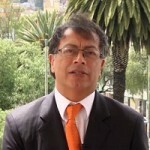 spoke to Gustavo Petro, who placed second in this year’s presidential race. Right-wing politician Iván Duque has been sworn in as Colombia’s new president. Duque was hand-picked by former right-wing President Álvaro Uribe and has vowed to roll back key parts of Colombia’s landmark peace deal with FARC rebels. Just before Duque’s inauguration, Democracy Now! spoke to Gustavo Petro, who placed second in this year’s presidential race, receiving 8 million votes in his attempt to become Colombia’s first leftist president. In the 1980s Petro was jailed and tortured for being a member of the M-19 guerrilla movement. He later went on to lead efforts in Colombia’s Congress to investigate ties between paramilitary death squads and top politicians.